When travelling with your pets there will be times when you need to eat as a family and that includes the family pets. Unfortunately in the UK dogs and other pets are not allowed into restaurants and cafes because of our health and safety regulations. The only dogs allowed into these establishments are guide dogs. Dining can be a problem when you know that you have dogs, cats or other pets with you. Never leave pets in the car while you go in to eat. I may seem over caste and cool but the sun can come out so quickly and before you know it the car is as hot as an oven. Pets die in these conditions even if you have left a window open and a bowl of water for them. If it is impossible to leave the pets at home you are going to have to plan where you eat when out for the day or travelling to destinations. Why not enjoy a family picnic when travelling with pets? They will appreciate the attention and enjoy the fresh open air. You can get away from the hot motorway and the fumes from the many vehicles on the roads. Find a nice picnic area or a green field and enjoy a break in your journey for a few hours. Make sure that your dogs and cats do not eat chicken bones or other unsuitable foods from the picnic. Pack some of their favourite biscuits or snacks so that they also enjoy themselves. 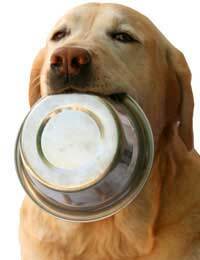 Do no overfeed your pets as they make have upset tummies when the journey is resumed. Many pubs and quite a few restaurants have gardens where guests can enjoy outside dining. These establishments quite often allow well behaved pets into the garden whilst the owners of the pets have their meal. If you are allowed to do this make sure your pets are secured so they do not wander and upset other guests. Also ensure that they have been to toilet before entering the eating area so that there are no embarrassing accidents where people are eating.Never feed your dogs from the table or let them lick the plates and cutlery. Hopefully you do not let your pets do this at home as it can spread disease but while out dining it is a complete taboo! If your pet is lively or a tad vocal it may not be enjoyed by other people who are dining. Keep your dogs quiet with chews or a toy and do not let them approach other people who may not be animal lovers. If you are on holiday and your pets do not settle while eating out you must really consider whether it is a good idea to take them with you. Is there a kennel or cattery that would take them in for a few days whilst the part of your holiday that is not pet friendly is enjoyed? Later they could join you for the rest of the vacation. Dogs are legally allowed in restaurants just not food preparation areas. It is restaurants themselves that put into place restrictions. Many are now allowing dogs.